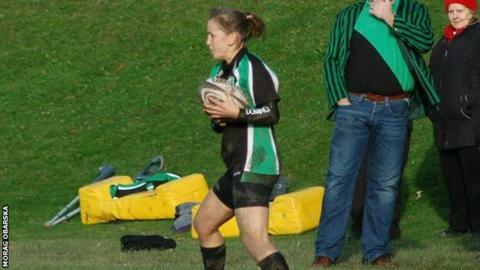 Rena Nelson says she is "over the moon" to be selected by the Midlands for the game against the North. Nelson, who plays for United Banks Ladies in Jersey, will start at full-back after impressing at recent trials. She only began playing rugby at the start of this season having played the touch version of the sport and is also an island netball player. "I'm over the moon at being given the opportunity, if a little anxious about my lack of experience," said Nelson. "I'm ready to give anything go and will play from my strengths gained through years of experience in touch rugby and the understanding of the game I've built up over the last few months." Nelson had only played four games of rugby before catching the eye of local coaches. They initially asked Jersey's local rugby divisional area, London and South East, if they would give her a trial. But as she had not played at county level they declined, so her coaches approached the Midlands, who agreed to give her a trial. It means she is effectively in the top 130 female players in England and will be watched by national team coaches as the Midlands face the North, South West and her 'home' association of London and South East. "After my first game of rugby I was absolutely buzzing with adrenaline," Nelson said. "I'm not sure I could ever have of anticipated how great my love for the sport would be."